Peter van Vossen was born	in 1968. Roel van Hemert was born	in 1984. Leroy George was born	in 1987. Paul Voss was born	in 1988. After previous spells in France and in Spain with Malaga, Kizito -Kiki- Musampa signed a 5-year contract at Atletico Madrid in June 2003. The transfer fee was around the 3 mln euro. 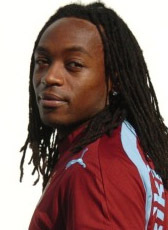 After a season with 26 appearances, Musampa felt out of the plans in the 2004-2005 season giving him a loan transfer to England for the rest of the season in January 2005. In June 2005, his loan contract was extended with another season after a successful spell at City. Musampa returned in the summer of 2006 to Spain without a clear future at his Spanish club. At the end of August, he was announced as the new signing of Turkish club Trabzonspor. He signed a 3-year contract until 2009. In July 2007 Musampa was fined with €250.000 due to -supposed misbehavior- (returning too late at the club after a vacation, while they changed the pre season details, but -forgot- to inform Musampa). According to the FIFA Trabzonspor did not have a valid ground to punish Musampa. Because of some delayed payments FIFA decided to -free- Musampa from the club and forced Trabzonspor to pay the player a years salary. Kiki Musampa went as free agent keeping up his condition at AZ Alkmaar where his former coach Louis van Gaal was the manager. AZ decided to offer Musampa a 1-year contract needing a left-sided midfielder. Both sides decided to cancel the contract in January 2008 with the arrival of left-footed Danish midfielder Poulsen. Kiki Musampa announced at the end of March 2008 the news that he has signed a 2-year contract at South-Korean club FC Seoul. Because the club was not able to pay his salary his contract was cancelled in May 2008. To keep fitness he trained, together with his former Ajax-colleague Nordin Wooter, at AGOVV Apeldoorn. In March 2009 he trained at Willem II, which were in desperate need of a fit midfielder. He signed a contract until the end of the season. Without finding a new suitable club for the 2009-10 season, Musampa retired from professional football. In December 2009 he announced together with Nordin Wooter the acquiring of Amsterdam amateur football club SC Nieuwendam. The club went bankrupt and the two former Ajax players decided to take over the club and were also planning to play in the first team of the 2010-11 season.